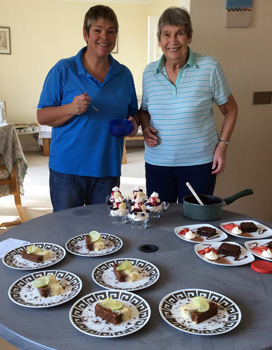 Solar Chefs and tasty puds! Two of our lovely supporters, Rachel & Brian Sammons, have raised funds for SolarAid by hosting a special SolarAid charity lunch. As well as selling tickets to 20 people that came and enjoyed a three course lunch with wine and coffee they also held a couple of raffles, one of which was for an SM100 solar light. In total they raised £326. The menu included four choices of soup: Leek and Potato, Red Pepper, Curried Parsnip and Apple, and Carrot and Coriander with the choice of main courses featuring Salmon with Parmesan & Parsley Crust or Italian Stuffed Hasselback Chicken. Clearly that wasn’t all as the photo shows a selection of rather impressive looking deserts too! Given that little selection we’re quite jealous we weren’t there. We had a really great lunch yesterday with lots of good food, promotion of the work that you do and of course chat! We were very pleased and lucky that the snow held off until today. Our daughter did a good job in the kitchen. All the best to you all at SolarAid and carry on the good work. We certainly will Brian – as long as you keep up the chat and promotion of SolarAid. Thanks so much to both you and Rachel and of course your amazing daughter who is obviously a very talented chef. Friends gather round for a super lunch to help raise funds for SolarAid.